Pallua | ! *PurpleMoon Creations* ! This peacock inspired dress won't let you go unnoticed! Fine textures crafted with lots of details embellish this gown from top to bottom. Includes 5 standard sizes and fitted version. 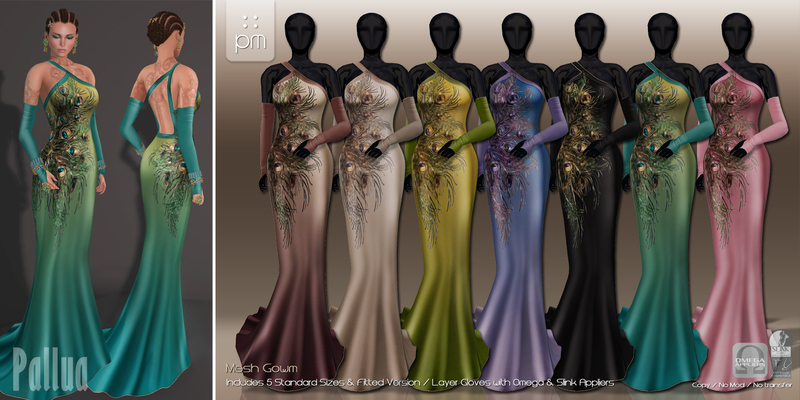 There is also included a matching pair of fingerless gloves available as a layer for classic avatars and with Omega and Slink Appliers for mesh bodies. The best part: 50% OFF until August 8th, 2015. Please, there is a DEMO version for the dress and the gloves, TRY IT!